Born in Chambéry in the Savoie region of France on October 23, 1866, François Charles Cachoud received his artistic training at the École des Beaux Arts (School of Fine Arts) in Paris. There, he became a pupil of the Neo-classical painter Jules-Elie Delaunay (1828-1891) and Gustave Moreau (1826-1898), known as the father of French Symbolism. 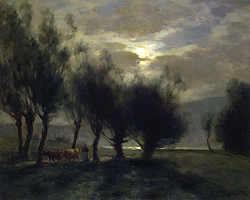 While he produced portraits and still life subjects, Cachoud was mostly known for his landscapes, especially those with moonlight views. In 1891, he made his debut at the French Salon in Paris where he exhibited regularly until 1940. He won a gold medal at the Paris Universal Exhibition of 1937 and was decorated as a Chevalier de la Légion d’Honneur (Knight of the Legion of Honor) in 1910. Cachoud’s works can be seen in a number of museums including the Musée des Beaux-Arts, Chambéry, Musée du Petit Palais, Paris, (France); and Philadelphia Museum of Art (USA).